In the Atlantic, the EEZ is a water zone beginning at 3 nautical miles and extending to 200 nautical miles off of the U.S. coastline, including the coastlines of U.S. territories and islands. These waters have been closed to striped bass fishing since 1990, when federal legislation was implemented in order to protect striper spawning and the rebuilding of the species, which was recovering from decades of overfishing. There is, however, one exception to the possession restriction. In the waters between Montauk Point, Block Island, and Point Judith, possession of Atlantic striped bass is permitted, provided no fishing activity is conducted from the vessel while in the EEZ and the vessel is in continuous transit. In the spring of 2017 many of the migrating striped bass headed north in deeper water beyond the EEZ limit (3 miles.) Thus fishermen had no chance to fish for them or catch them. This is based on reports from commercial fishermen who reported seeing striped bass chasing bunker on the surface out in deeper water. A recent book " The Most Important Fish in the Sea " by H. Bruce Franklin states that Menhaden are the most important fish in the sea. This is because they are the main food source of our most valued saltwater food and gamefish, including striped bass. The author also stresses that this important fish is being strip-mined, and very much endangered, by excessive harvesting by the menhaden reduction fishery. Although 13 of 15 East Coast states have outlawed the menhaden reduction fishery, Virginia, North Carolina, and all the Gulf states except Florida still allow it. One company - Omega Protein, completely dominates this destructive industry. put fish oil in human food. If you want to read a truly disgusting article, read the article titled "Fishmonger" in the December 2008 issue of Forbes Magazine. The article describes how schools of Menhaden are swept up by boats using a 1,800 foot net after being identified by a spotter plane, then vacuumed into tanks aboard a 166 foot steamer. A day long process of drying and grinding turns the menhaden into fish meal and fish oil. dominates this sorry business earned $12 million on $157 million of revenue in 2007. Joseph von Rosenberg, the chief of Omega Protein, wants to expand this business by injecting fish oil, which is rich in omega-3 fatty acid, in human food. In 2012 the Atlantic States Fisheries Commission's Menhaden Management Board established the first catch limit ever for the fishery. The commission established a catch limit of 170,000 metric tons for 2013, a 20 percent reduction from the average catch between 2009 to 2011. On Dec. 4 , 2016, Paul Santa Barbara caught a 64 pound striped bass while trolling a 32-ounce Mojo at Overfalls Shoal in Delaware. The striper was 50 inches long and had a girth of 30 inches. To see this striped bass and more about it, follow this link: Pending Delaware State Record Striped Bass. 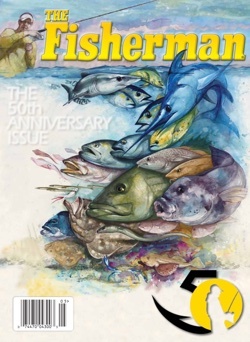 May, 2016 marks the 50th anniversary of publishing for The Fisherman Magazine. The May, 2016 issue is a special collectors edition. The cover shows all the gamefish of the Northeast region. The Maryland Department of Natural Resources Striped Bass juvenile index (YOY), is a measure of Striped Bass spawning success in the Chesapeake Bay. For 2015 the YOY was 24.2, and above the 60-year average of 11.7 and higher than the previous three years. These results indicate a healthy level of production of striped bass. 6 year old Sam Adams caught a 41 pound, 47 inch striped bass from the surf at LBI, NJ on November 7 th, 2015. See it on Sam Adams. 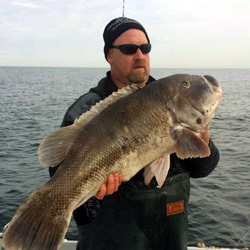 On Friday, January 2 2015, Kenneth Westerfeld caught a 28 pound, 13 ounce Tautog (Blackfish) fishing out of Ocean City, MD. The fish was 35 inches in length. On May 5th 2015 it was confirmed and became the new world record. With few exceptions, 2014 has been a very poor year for Striped Bass fishing all along the striper coast. The Atlantic States Marine Fisheries Commission's Striped Bass Management Board met in Mystic Connecticut in October, and voted to reduce striped bass fishing mortality by 25%, for both recreational and commercial fishermen, in the coastal fishery in 2015. The board approved a coast-wide recreational limit of one fish per day that must be at least 28 inches in length. However this rule now seems like it will be modified to allow 2 fish, 1 fish of between 28 and 43 inches and a second fish of over 43 inches. The jetty at the south end of Island Beach State Park (This is the North Jetty of Barnegat Inlet) was damaged during the Sandy Super Storm. During the summer, and early fall, of 2014 the jetty is being repaired by the Corp of Engineers. Fishing is not allowed near the jetty. Fishing is allowed throughout the park, just not near the construction going on near the jetty. The work on the Jetty is now complete. The Jetty and beach are now open to fishing. 2013 - The recreational catch of wild striped bass on the Atlantic Coast has dropped 65 percent in the past seven years according to the National Marine Fishery Service (NMFS), a precipitous decline that is mirrored in the 2013 membership fishing survey just tallied by Stripers Forever. Members reported that that their striper fishing got progressively ‘worse’ or ‘much worse’ over the past five years and that the fish they did catch were smaller. On Feb. 28 2013, James Bramlett caught a 69 pound 9 ounce pound freshwater striped bass. On May 13, 2013 it was approved by the IGFA, and became a new world record freshwater striped bass. 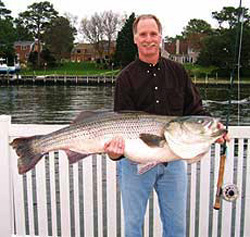 Follow this link to see Jim Bramlett's huge landlocked striped bass. Ben Smith of Bryn Mar PA, now owns the Delaware State Striped Bass record. Ben caught his record striped bass on Dec. 8th 2012. His bass was weighed on a certified scale at the Old Inlet Bait & Tackle shop in Rehoboth Beach. The striper weighed 52 pounds, and had a length of 51 in. and a girth of 30 in. Ben caught his huge striper while surf fishing at the Delaware Seashore State Park, in the early morning, using fresh bunker on a fishfinder rig. The previous Delaware record striped bass weighed 51 pound 8 oz. and was caught in 1978. You can find some information about conditions along the beaches by following our Fishing Report links. These are links to bait and tackle shops and other websites along the striper coast that provide fishing reports. Some of these sites have forums where members have been posting reports about conditions and even some photos. Posted Nov. 2012. The Maryland Department of Natural Resources (DNR) announced that the 2012 Young of the Year (YOY) Striped Bass Survey measured an Index of 0.9, well below 2011's result of 34.6, and well below the long-term average of 11.9 This is the lowest measurement of striped bass spawning success in the Chesapeake Bay, in the survey’s 59-year history. The September 2012 issue of Audubon Magazine includes an interesting article about Off-Road Vehicle (ORV) beach access at the Cape Hatteras National Seashore. On February 2012, The National Park Service implemented a "final plan" for managing motorize access at Cape Hatteras. Under the plan, 28 of the seashores's 67 miles are designated for year-round vehicle use, while 26 miles are set aside for pedestrian and wildlife. Except during peak tourist season, ORVs have access to the remaining 13 miles. Follow this link to see a photo of Cape Hatteras National Seashore. On Saturday, March 31st, 2012 I received the e-mail shown below. Bob, Just checking out your website and came across the record book stripers. I belong to Marin rod and gun club in calif. For as long as all the old time club members can remember , an old photo of a man with a huge striper has hung on the club wall. Perhaps since 1927 when the club opened. The photo reads "Charles Bond, striped bass 87.5 lbs, 5'7" long, San Antonio creek, clams for bait". If interested I could forward a photo. 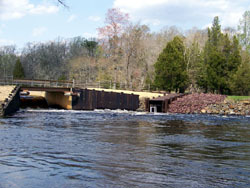 On February 16th, 2012 New Jersey closed the river herring fishery. It is not because there are not enough river herring, but because they do not know. The state claims they don't have the resources to keep up with the interstate requirements for management plans. I read in a local NJ shore newspaper that some mates on headboats were gaffing fish, then determining if they were keepers. I went on a headboat to see if this was true. It was. The mates were gaffing everything. They would throw the short stripers back overboard. I questioned a mate about this. He said not to worry, most would survive anyway. Shortly after, a short striper came floating by, belly up. See photo to right. On Thanksgiving Day, 2011 the, striper bite was on, in the waters around Island Beach State Park. Headboats that usually stay out until 2.00 PM came in at 10:AM, as everyone had caught their limit. The word soon got out. The next day, Black Friday, the ladies all went shopping. The men went fishing. I did too. The waters around IBSP were super crowded with boats. See photo to right. On Wednesday 16 Nov. 2011, The Atlantic States Marine Fiseries Commission voted to reduce the amount of menhaden that may be caught by 25%. Chesapeake Bay, in the survey’s 58-year history. place to surf fish for striped bass in the fall. The entrance to the beach there is narrow, and often beach buggies that go there have to leave before high tide. This year (2011) the storms have badly eroded the beach and beach buggies access to the beach is severely limited. 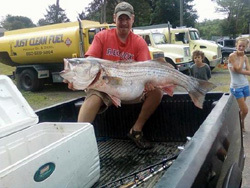 An 81 pound striped bass was caught on the night of August 4, 2011 in Connecticut waters. The striper was boated by Greg Myerson and weighed in at 81.88 pounds, which edges out the previous record of 78.8 pounds caught in 1982. Myerson caught his huge striper drifting a live eel near a submerged boulder, near the Outer Southwest Reef off the coast of Westbrook, Connecticut. His striper measured 54 inches in length. On June 19th, 2011 Peter Vican caught an even bigger striped bass while fishing near Block Island. This striped bass weighed 77.4 pounds. He caught it on Eels. Because of difficult economic conditions, the NJ Angler Magazine will not be published after Dec. 2010. A June 2009 article in the Philadelphia Inquirer identified feral cats as the greatest threat to Piping Plovers. It also mentioned Fox, but not surf fishermen or beach buggies. On December 17th, 2009 Richie Keatley of Norfolk VA caught a 51 pound, 5 ounce striped bass on a fly rod while fishing around the piers of the Chesapeake Bay Bridge Tunnel. He caught the striper on a blue-tinted 3/0 clouser fly while fishing from a 22 foot boat. His striped bass is a pending IGFA world record for the 20-pound tippet Male Fly Rod Class. As of Feb. 8, 2010 the Coast Guard will shut down the Loran navigation system. The satellite-based GPS system is now being used by boaters for navigation, making the Loran-C system obsolete. The advent of planer boards into the mix has certainly changed the playing field for fish and fishermen alike. The ability to cover a 200’ to 500’ wide swath while trolling an array of 20 to 30 fishing lines with up to two lures per line has really changed everything in regards to trolling for large striped bass. The concept of catching and releasing dozens of fish in an outing or even a dozen at a time is something most of us would not have imagined a few years ago. The shear numbers of fishermen that are catching and releasing these large fish should cause us all to pause for a moment. Let us not lose sight of the resource in all of this catch and release fun. These large pre-spawn striped bass are in a vulnerable situation when it comes to stress and the future generations of striped bass that they carry in their bellies should always be the first and foremost importance to us all. This item is from The Maryland DNR website, April 2009. 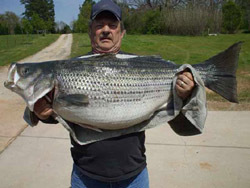 On April 3rd, 2009 Terry McConnell caught a 63 pound, 4 ounce freshwater striped bass in Lake Russell. Lake Russell spans the Georgia/South Carolina border. He caught it on a blue back herring. When it is certified it will become both the Georgia and South Carolina state record freshwatwer striped bass. The fish breaks the previous record for both states of 59 pounds, 8 ounces that was caught by the same fisherman in Lake Hartwell. Brigantine's north end is a great place to fish, however is not accessible at high tide, and is often almost all covered over at the highest tides. Fishermen go there as the tide goes out, and have to get themselves and their buggies out of there before the tide comes back in too far. Follow this link to see what happened to someone who waited too long. Link to: Swamped Beach Buggy. Starting February 1st, 2009 the Coast Guard will stop responding to Analog Beacons. The Coast Guard will no longer respond to analog signals which are false alarms 98 percent of the time and are accurate to within no better than a dozen miles. Digital EPIRBS - Emergency Position Indicating Radio Beacons - generally have replaced analog beacons. They produce a signal 50 times stronger, are only one-third as likely to cause false alarms and can include an embedded global-positioning indicator that shrinks the search area to a 100-yard radius. WD-40 was created in 1953 by three technicians at the San Diego Rocket Chemical Company. Its name comes from the project that was to find a "water displacement" compound. They were successful with the fortieth formulation, thus: "WD-40." WD-40 is said to attract fish. Some claim that if you spray a little on live bait or lures, you will be catching the big one in no time. The basic ingredient of WD-40 is fish oil. Om May 7, 2008 at at 2:30 AM, David Alu of Jackson NJ, caught a 19 pound 12 ounce weakfish while surf fishing for striped bass on the shores of Raritan Bay. He caught it on a bunker head. The weakfish was 37 inches long and had a girth of 23 inches. This weakfish is a pending IGFA world record, as the current all-tackle weakfish on the books weighed 19 pounds 2 ounces. David was guided in his efforts by Rich Swisstack, of the Shore Catch Guide Service. The American Striper Association (ASA) has been looking for a Striper Tube capable of keeping a large fish alive and fresh for release after weigh-in at their tournaments. In 2007 they tested this tube on the tournament trail with very good results. They will have these tubes available for ASA members and will be displaying them at upcoming events. The Tube is 12" by 12" by 48" and stands upright. 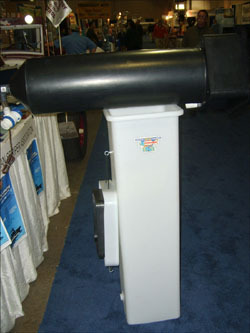 It has a pump built in that you can attach to a power source for water circulation making the tube self contained. In 2009 the ASA will encourage the use of the new striper tube at tournaments by offering a bonus weight for a successful live release. Yo-yoing is a technique used to jig in deep water using weighted fresh whole bunker, or bunker chunks. With whole bunker, the bunker is loaded with lead or other metal which is stuffed down its throat and secured. The object is to make the bunker bait heavy, so that it can be sucessfully jigged in deep moving water, near structure. Apparently some, or many of these prepared baits are somehow ingested by striped bass, and end up in their stomachs, as can be seen by the photo on the right. The photo shows the stomach content of a single 44 pound shore-caught striper, which consisted of numerous metal objects that weighed a total of about 2.5 pounds. The photo is from the January 2008 issue of "On The Water Magazine". Both the November 2007 and January 2008 issues of this magazine had informative articles about yo-yoing for striped bass. The magazine supports banning traditional yo-yoing techniques, as do we. The striped bass fall migration is now extending into the winter months. In the past most recreational fishermen put their boats away by mid November, but some are now keeping them in the water longer, hoping to catch striped bass. On Nov. 29th 2007, four fishermen capsized their boat in Delaware Bay. Three were rescued, but one other was found dead under the capsized boat. The very next day three fishermen capsized their boat off of Atlantic City. All three were dead when found. These fishermen were all fishing for striped bass. The ocean and bays can be cold and treacherous places in the late fall and winter. Why are we catching less stripers and more rays, skates, and small sharks? According to a March, 2007 article in Science Daily - A team of Canadian and American ecologists has found that overfishing the largest predatory sharks, such as the bull, the great white dusky, and hammerhead sharks, along the Atlantic Coast of the United States has led to an explosion of their ray, skate, and small shark prey species. The study also cites shellfish, including hard calms, population declines in areas occupied by cownose rays. This item is from the August, 1941 issue of National Geographic Magazine. North Carolina leads the South Atlantic States in commercial fisheries. Menhaden account for the major portion of the annual catch. 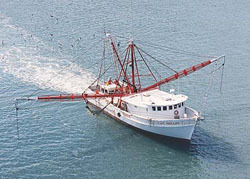 More than 40 vessels operate out of Morehead City in search of "fatback", as these fish are locally called. From April to June, and October to January, the boats cruise the coast. In seven plants in Morehead City and Beaufort, the menhaden are steam -cooked and passed through hydraulic presses. Their oil is used as a substitute for linseed oil and in the manufacture of linoleum, paints and varnishes, and insecticides. The residue becomes fertilizer. In 1879 Dr. Livingston Stone sheparded 132 fingerling striped bass, in wooden barrels and milk cans, from the Navesink River in NJ, to San Fransisco Bay. They survived the long train ride and were deposited in the Bay. Today striped bass is one of California's top ranked sport fish. Link to more about: California Striped Bass. The word record striped bass caught on rod and reel weighed 78.5 pounds, and was caught by Al McReynolds in 1982. An even larger striped bass, weighing 92 pounds, was caught in a net by the Maryland Department of Natural Resources during a research project in 1995. Link to these: Big Stripers. In 1941 the Santee and Cooper Rivers were dammed producing the Cooper-Santee Reservoir in South Carolina. Striped bass that had been in these rivers at the time became landlocked, and cut off from the ocean. As it turned out these striped bass thrived in this freshwater environment as these waters also supported large populations of threadfin and gizzard shad which the stripers feed on. Link to more about: Freshwater Striped Bass. River Herring, Alewives and Blueback Herring, which were once very abundant are becoming scarce. One reason is that dams have been built on many streams that block these migratory fish from their spawning grounds. Many states are now taking action to correct this by building fishways and slotted fish ladders that provide bypass channels around the dams. The top picture on the right shows the entrance to a fish ladder that was recently built by the State of NJ at Batsto, around a dam that blocked a tributary to the Mullica River. The second picture on the right shows a fish ladder that was recently built at Great Egg Harbor River where it connects to Lenape Lake in NJ. Link to more about: River Herring. The 2007 January-February issue of Audubon Magazine includes an article called "Beach Bums". The article centers on the North Carolina National Seashore, including Cape Hatteras, where it is stated that ORVs sometimes travel at 50 mph, run over birds, and endanger people. Physical injury is the most important factor influencing the survival of released fish. 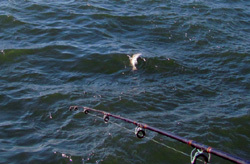 Deep hooking when fishing with bait that injures vital organs results in low survival. In the study 476 striped bass were caught with conventional bait hooks and 640 with non-offset circle hooks. The deep hooking rate for conventional bait hooks over the course of the study was 17.7%, and was 3.4% for non - offset circle hooks. The study was performed by the Maryland Department of Natural Resources Fisheries Service. The 2006 Martha's Vineyard Striped Bass and Bluefish Derby was held from Sept 15th to Oct. 15th. Eighty nine striped bass were weighed in. The largest boat-caught striped bass of the derby weighed 43.86 pounds, and was caught by David C. Hearn. The largest shore-caught striped bass weighed 40.19 pounds, and was caught by Leo C. Lecuyer. Link to more about: Striped Bass Fishing Tournaments. Linkk to more about: Martha's Vineyard. Presently fishing for striped bass is not allowed beyond 3 miles from shore. The Atlantic States Marine Fisheries Commission had recommended eliminating this restriction. However on September 7th, Dr. Bill Hogarth, director of National Marine Fisheries Service(NMFS), turned down this recommendation. The exclusion zone beyond 3 miles from shore will remain.